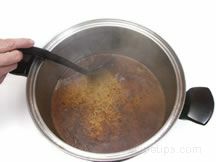 Braising and stewing are very similar moist heat methods of cooking. They both use the same process of searing to enhance color and flavor, and slow cooking in liquid to produce tender, moist meat. Once the meat is browned it's simmered in a covered pan, either on top of the stove or in the oven. The liquid used in this process is diffused through the meat as it cooks, which works to loosen and tenderize the fibers of the meat. Braising and stewing work well for some of the tougher cuts from the shoulder and leg/ham, but is also used for cuts such as ribs and chops. 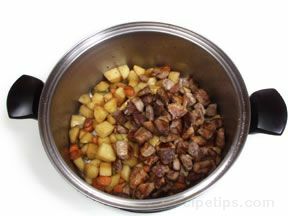 Braising and stewing are almost identical methods except stewing involves the use of more liquid and the ingredients, including the meat, are cut into smaller size pieces. 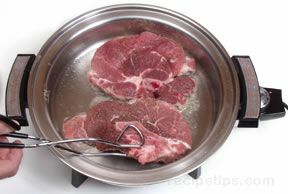 Braising generally involves smaller cuts such as ribs, steaks, chops, and sausage. When the same process is used with larger cuts, such as roasts, it is sometimes referred to as pot-roasting. It is best to not use lean cuts, such as tenderloins, because they have a tendency to become tough from the longer cooking time. It is beneficial to use the same pan to sear the meat and to simmer the meat so that any pieces remaining in the bottom of the pan will help to add flavor when the sauce is made. Select a heavy sauté or frying pan that is both suitable for the stove top and the oven. The pan should have a fairly tight fitting lid to prevent moisture from escaping. If you use a different pan to finish the cooking process than was used for searing, be sure to deglaze the bottom of the searing pan and use as part of the stewing or braising liquid. Deglaze by adding a little liquid to the bottom of the searing pan and heating to a boil, scraping the bottom to loosen all the browned pieces. Add this deglazing mixture to the pan that will be used to finish cooking the meat. The searing of the meat is not absolutely essential to the cooking process, but it does help to provide for a deeper colored sauce. Even though you are working with tougher cuts of meat, it is not necessary to marinate the cuts before braising or stewing, unless the cut is extremely tough. 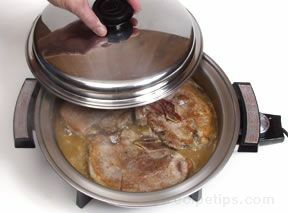 Generally slow cooking the meat in the liquids that are added will provide very tender results. Extra flavor can be achieved by using broth, wine, sherry, beer, citrus juices, or vegetable juices as the liquid or part of the liquid that is added for simmering. Other ingredients that can be added to enhance the flavor are herbs and spices, fresh or dried fruit, black olives, walnuts, and mushrooms. Stewing: To begin stewing, trim excess fat from the pork cut and thoroughly dry the meat off with a paper towel to ensure even browning. The meat can be lightly coated with flour before searing to aid in browning the meat, but it is not essential. Heat enough oil, or an oil and butter mixture to sufficiently cover the bottom of a heavy pan or Dutch oven, and then place the meat in the heated pan. To ensure even browning, do not overcrowd the pieces. Cook over a medium high heat until pieces are nicely browned on all sides. Once browned, remove pieces from the pan using tongs or two wooden spoons and then quickly sear vegetables and any other desired ingredients in the same pan. Any vegetables that are not suitable for a long cooking time should not be added until the last 20 to 40 minutes of the cooking process. After searing, discard excess grease and place the meat back in the pan. Add required liquid and flavorings. Heat until the liquid is just coming to a boil and then cover and reduce heat to a gentle simmer, cooking until the meat is done. To prevent the meat from becoming dry and stringy, keep the liquid at a simmer through the remaining cooking time and do not allow it to boil. The meat should be checked occasionally throughout the cooking period to see if the liquids need replenishing. 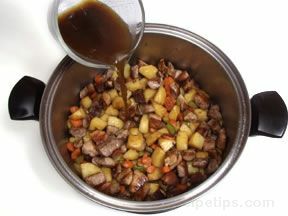 When done, the pork and other ingredients should be removed from the pan so that a pan sauce or gravy can be made. 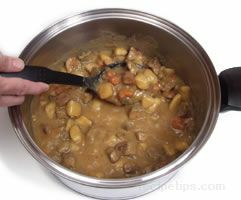 When stewing, thickening of the liquid may or may not be required, depending on the recipe. The stewed meat and other ingredients are added back in with the sauce or gravy and all are served as one dish. 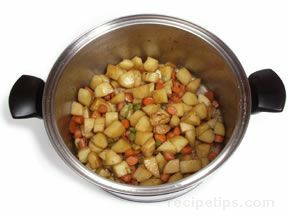 When the meat and other ingredients are ready to be stewed, the covered pan can also be placed in a low temperature oven (275°F to 325°F) to finish cooking, rather than on top of the stove. If a different pan will be used to finish cooking the stew than what was used to sear the meat and vegetables, the searing pan should be deglazed and the liquid produced from deglazing should be added to the pan that will be used to complete the stew. 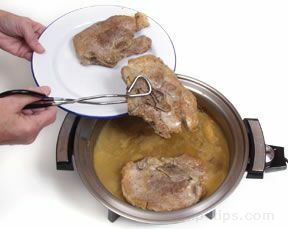 Braising: To begin braising, trim excess fat from the pork cut and thoroughly dry the meat off with a paper towel to ensure even browning. The meat can be lightly coated with flour before searing to aid in browning the meat, but it is not essential. Heat enough oil, or an oil and butter mixture to sufficiently cover the bottom of a heavy pan. Place the meat in the heated pan and sear over medium high heat until pieces are nicely browned on both sides. To ensure even browning, do not overcrowd the pieces. 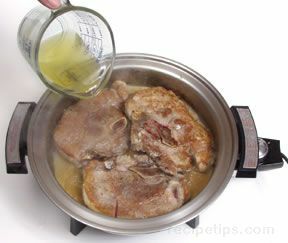 Once browned, discard any excess grease and then add the braising liquid. Bring the liquid to a boil, and then reduce the heat to low. Cover and continue to cook at a gentle simmer. Cook until meat is tender. The length of time will depend on the type and thickness of the cut. 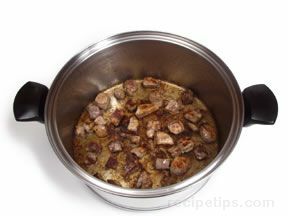 When done, remove from the pan and boil juices to reduce for a sauce to accompany the meat when serving. 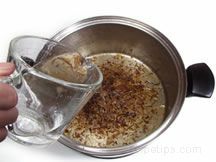 To prevent the meat from becoming dry and stringy, keep the liquid at a simmer through the braisng time and do not allow it to boil. The meat should be checked occasionally throughout the cooking period to see if the liquids need replenishing.